*A receiver with HDMI support is required for decoding multi-channel surround sound. ** The quality of video and music delivery may vary depending on hardware and network environments. *RAID groups of storage pools cannot cross multiple enclosures. **The maximum capacity is calculated by using 8TB HDDs. • Instant Alert Notifications: With the SMTP and SMS settings on the Turbo NAS, system administrators will get notifications via SMS or email if an error occurs. • Resource Monitor: Easily monitor CPU, memory, disk & network bandwidth usage, as well as currently-running Turbo NAS apps and services. • Wake on LAN: Administrators can turn on the Turbo NAS via LAN to save energy and improve security. • Scheduled Power on/off: Administrators can flexibly set up the time of powering on/off the Turbo NAS, with a maximum of 15 schedules for setting powering on, off, or rebooting. • S.M.A.R.T. & Advanced Hard Drive Health Scan (HHS): The Turbo NAS supports HDD S.M.A.R.T. (Self-Monitoring Analysis and Reporting Technology) which monitors the hard drive status, and sends out email notifications for administrators to take action. The HHD Health Scanning technology can also examine hard drive status and prevent possible data loss. • Comprehensive Event Logs: The Turbo NAS supports Syslog server that collects logs from various connected devices over the Internet and saves the data, enabling centralized log management with greater efficiency. • FTP Server: The Turbo NAS supports FTP server to share large size files, coming with user-defined settings including bandwidth limitation, number of connections, and write-only permission. • Web Server: The Turbo NAS supports Web server which allows numerous websites built on the same server conveniently. Administrators can manage up to 32 websites on the single one Turbo NAS for reduced IT costs. • RADIUS Server: The Turbo NAS supports RADIUS server which provides centralized authorization management for computers to connect and use a network service. • VPN Client: QTS also supports VPN Client for PPTP and OpenVPN to protect your privacy during data transmission. • Printer Server: The Turbo NAS supports Printer server to send remote printing request over the Internet (max. 3 USB printers), and supports IPP (Internet Printing Protocol), Samba, print job management and Bonjour printing for Mac OS X. • Surveillance Station: The Turbo NAS supports Surveillance Station to connect and manage multiple IP cameras remotely, including real-time monitoring, video recording, playback, and event notifications. Features • Centralize your file storage, sharing and backup with excellent performance. • Run multiple Windows®/Linux®/UNIX®/Android™ based virtual machines with the Virtualization Station. • Operate multiple isolated Linux® systems as well as download containerized apps with Container Station. • Play 1080p videos with the bundled remote control and 7.1 channel audio pass-through via HDMI. • Transcode Full HD videos on-the-fly or offline. • Stream multimedia files via DLNA®, AirPlay®, Chromecast™ and Bluetooth® with multi-zone multimedia control. • Quickly find specific files by real-time, natural search with Qsirch. • Scale up to 10 drives with QNAP UX-800P expansion enclosures. HDD Form Factor 2 x 3.5"/2.5"
2 Bay Qnap TS-251+-8G NAS Intel Celeron 2.0GHz Quad Core, 8GB DDR3L, SATA 6Gb/s, 2x GbE, Hardware Transcoding is rated 5.0 out of 5 by 1. 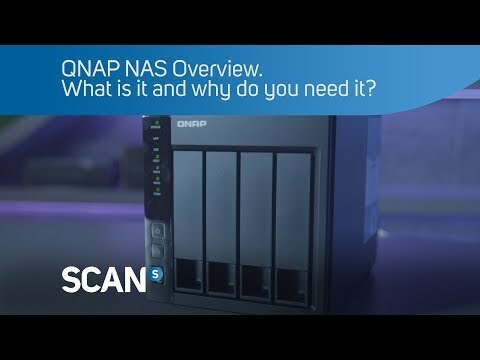 Rated 5 out of 5 by Welcome99 from Qnap TS-251+ 8GB Much More than a NAS This is a true mini-server with macro performance. The fact that it supports all the normal NAS requirements plus allowing for the hosting of VMs is to me the main selling point. It has allowed me to set up two LAMP VMs to act as web servers for two of my internet domains. It is well designed and built and once loaded with 2 x 4TB WD Red WD40EFRX SATA 6Gb/sec drives which are mirrored using RAID 1, has performed excellently. I have had this product for just over a month now and am very satisfied with it.